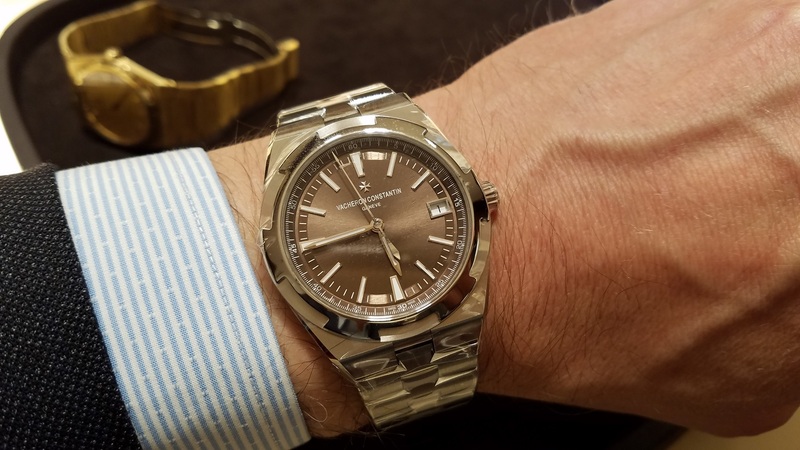 TimeZone : Vacheron Constantin » Overseas improvement? I regret selling my Overseas automatic (second version) so was thinking about adding a new Overseas (what I will call the third version). But other than the open case back which is a nice touch, I think I like the second version better than the third. I like the numerals on the face, the guilloche type dial, and the chrono version had a big date which is missing now. What do others think? The blue dial is lovely on the newer version but it looks too much like the Zenith Chronomaster. I have had the 2nd gen in 4 different versions and although I loved it, I think the new version is a "fresher", more now look and the old one just a little dated. That being said, its still an amazing watch. The in house movement w see through back and quick change system add alot on the new one. I had forgotten about the quick-change system. It's a great idea and works well. I guess the layout of the dial is a personal choice. First, here are examples of the third generation of Overseas in the Chronograph and Automatic. Can you tell I have a serious thing for the brown dials? As others have mentioned, the quick strap/bracelet change is a HUGE improvement over the prior generations. You can literally transform your watch in a matter of seconds without fear of damaging the case. This feature alone is a reason to go for the third generation, IMHO. The rest of the changes amount to what is more like an evolution rather than a revolution in design, to paraphrase a much more astute collector and friend of mine. Yes, in the chronograph you lose the big date. In the Automatic, by contrast, the date is now positioned much better than in the corresponding models of the previous generation. The bracelet for the third generation now offers micro adjustments for a more comfortable ride. The case has been softened a bit for the third generation, and it is a matter of personal taste which case design you prefer. The second generation is perhaps a bit more brutalistic. 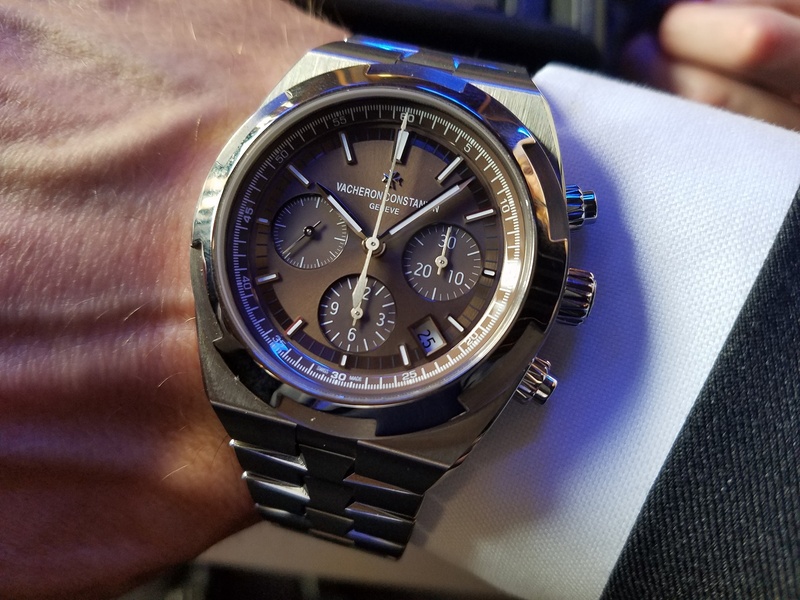 The chronograph pushers are now unlocked much more quickly and easily on the third generation than on the previous generation of Overseas Chronograph, which is a terrific if less often discussed improvement. If it is an in-house movement that gets your juices flowing, then the third generation is for you -- and you get a view of the movements from the back to boot. I personally am happy with the older movements, which have been tried and tested in the field for years and perform extremely well, and I don't mind the engraved case backs of the second generation. I don't mind them at all! So, here are a couple of examples of the second generation with which I have a lot of personal experience. ;-) In all bias, these are my two favorite Overseas. Period. 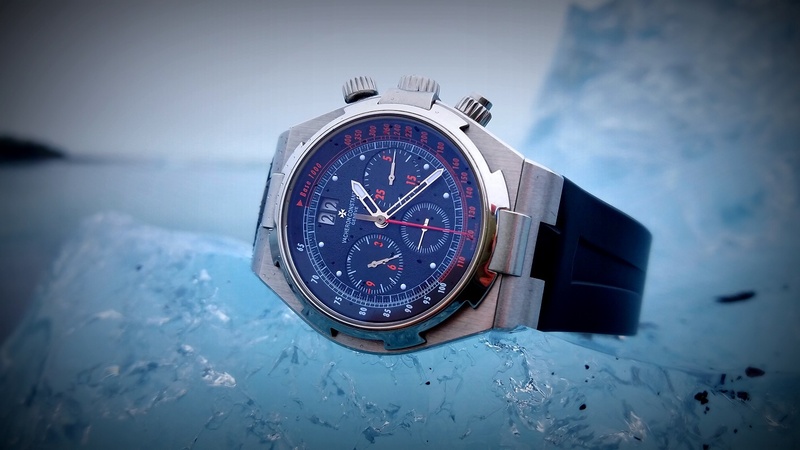 The above chronograph does not have the more usual (stamped) guilloche pattern that is more common to the second generation Overseas, but you get the idea. The above "Deep Stream" Automatic has a sunburst dial (hard to tell from this photo). My take is that if you have never owned an Overseas, you might as well go with the third generation and get the advantage of being able to change your strap effortlessly. It is worth it. If one already owns a second generation Overseas, then I think it is less compelling to make the switch if you are happy with what you have. Since you(the original poster) have already owned a second generation but it is not longer with you, you might well consider a third generation. Mine is on ice for a while. Well, it is at the "spa," anyway. I figured after 10 years, maybe I should send it in for its first service. Mine is on the bracelet at this time. I agree with your other post. It's a beautiful layout and has a very fine movement even if it isn't in-house. ...exclusively. It is so comfortable and great for the hot weather in Philly that begins in May and does not end until late September typically. LOL. Thanks for the detailed response. The quick change strap is a big improvement. I think that the strap system is great; a huge improvement! Visually, I prefer the previous generation. On the current version, the bezel just does not stand out as much; it seems to blend into the case more. I am going through a similar situation. Examining all available information I have decided to pay the huge price tag for version #3. First of all, I love the blue and you pay such a premium for a blue second generation it makes me lean for gen 3. I love the strap system, the in house movement (sorry royal oak) and the display back. Geneva hallmark is not a bad thing either. Anyway mine should be here Monday and I believe this one is a forever keeper. The weather is similar here, of course. But everytime I think about putting in on, I change my mind. The bracelet is such a beautiful design and very comfortable. As nice as the second gen overseas was I believe I prefer the new one better. The new movement, display back and strap options are hard to ignore. Plus, it's slightly bigger and thicker as well. I like that. Looking forward to delivery of mine. I prefer the second generation as well. It is more distinct looking and the dial (I had the white version) is beautiful.